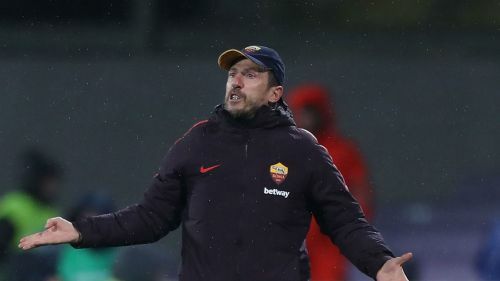 Eusebio Di Francesco is adamant he will not walk away from Roma despite watching his side thrashed 7-1 by Fiorentina in the Coppa Italia on Wednesday. Despite signing the likes of Javier Pastore, Davide Santon, Justin Kluivert and Steven Nzonzi ahead of the 2018-19 season, Roma have struggled for consistency. They currently sit outside the top four in Serie A and saw their hopes of some domestic silverware emphatically ended in Florence. A Federico Chiesa hat-trick, two for Giovanni Simeone and goals from Luis Muriel and Marco Benassi secured a stunning quarter-final victory for Fiorentina and put Di Francesco under more pressure. But the Roma boss – who has guided the Giallorossi to the Champions League knockout stages – has no intention of walking away from the capital club. "We cannot afford to be embarrassed like that and behave that way during a game," he told a post-match media conference. "It was a terrible performance in every area. "I will reflect on the situation and I am sure the club will too. The match confirmed some issues that had been only hinted at during the campaign. "However, I can rule out a resignation. That has never been a thought in my mind." He added: "All we can do is apologise to our fans. I struggle to explain what happened, as it was a game we got wrong in every conceivable way. It was shameful. "The frustrating thing is it's so inexplicable. Every time we think we are healed, we discover the illness is still there."